The young popular ICT expert, Business Mogul and Philanthropist has again received a distinguished award from the globally renowned Young Entrepreneurs Award for his commitment to entrepreneurship and economic development in Africa. He was presented the award at the event of Young Entrepreneurs Award and Summit under the category of "2018 Top Five Outstanding Entrepreneurs in Nigeria". 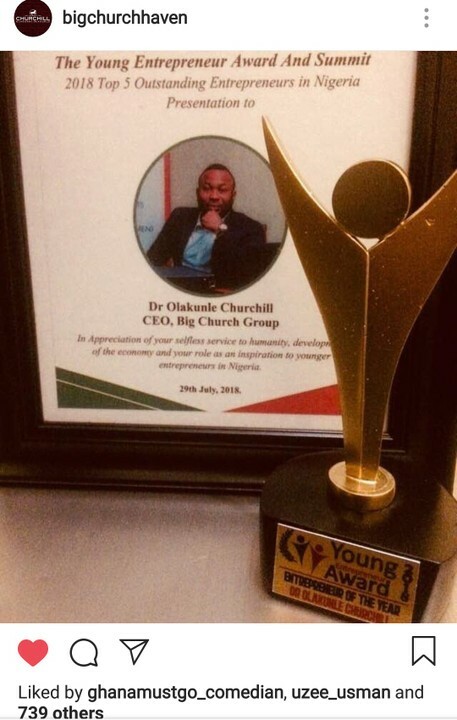 Dr. Churchill Olakunle also received the Award of "Entrepreneur Of The Year". Dr. Churchill remains a sun to the vision of several youths and aspiring entrepreneurs in Africa.